This novella is a companion novel to the Hopeless series, but can be read as a standalone. This book was my Valentine's Day read. I was looking for a book in my pile and I'm just planning for a quick read because I still have to study for work and I found this book so, I went out and go to a coffee shop and read this book and that's how I celebrated my heart's day. It was fun though. I'm always in love with the cover of this book and I got this one as a Christmas present from my bookish friend. This is my first time to read a Colleen Hoover book too and I seriously loved this one and enjoyed reading it. A quick read turned to be a really quick one which I really didn't expect. 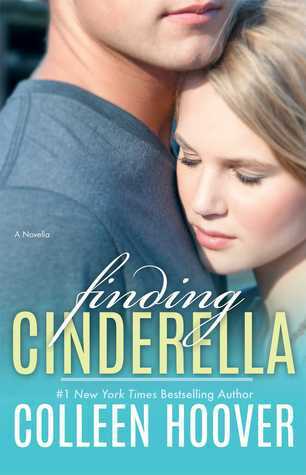 I got so caught up with the story and I knew at that moment that Daniel found his Cinderella. Finding Cinderella for me is such an exciting kind of book. Exciting in a way where you met a stranger, make out and love him/her and after years of not seeing each other your heart knows that it is still that person you loved since the day he/she decided to run away. It's not everyday I read that kind of book, with this one I loved it. I am now thinking of buying Colleen's other books which I'm sure I will. The story is simple but you'll love each part of it. You will be able to guess who Cinderella is but you'll think about her reaction when Daniel revealed the truth. It was something I didn't expect too. The revelations caught me off guard but I'm good with it, I'm just happy with the good ending though. At least things turned out good at the end. Hmmm.. what more to say? Such a sweet, lovely quick read kind of book that I'm sure every reader loved. One more thing. I read the author's note and it inspires me a lot! I won't give up on my dreams then and keep trying. I host a book-a-day giveaway on my Facebook, Instagram, and Twitter pages. I give something away every single day, so don't miss out!